This program started as a personal project. Eventually it turned into something that I felt might be useful to others. As with many of my programs it requires an exported XML file of your collection. 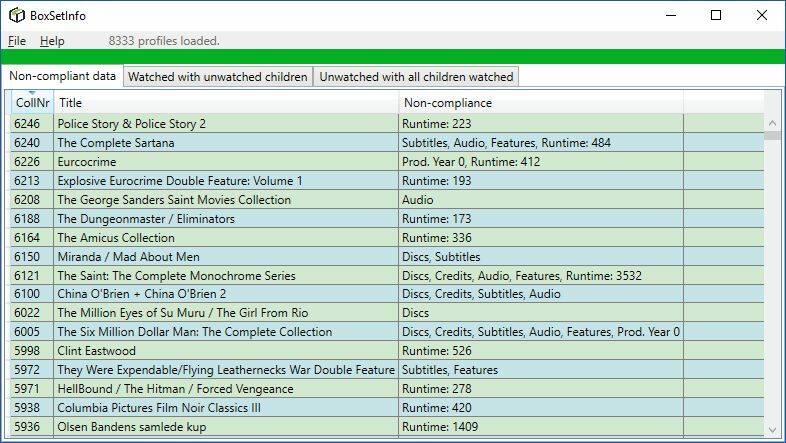 The Non-compliant data tab shows box set parents whose data does not comply with the rules for box sets. You may of course have any data locally in your profiles, but if you intend to upload them to the online database, they should follow the rules. See the box set rules here. The Watched with unwatched children tab shows box set parents that have a watched date set, but one or more of its children do not. The Unwatched with all children watched tab shows box set parents that do not have a watched date, but all children do. These tabs are the ones that started as my personal project. I had use for them, not everyone will. Note that I don't differentiate between which user has watched them, as I only mark titles watched by myself. Double-clicking a row in the results will select that title in DVD Profiler, assuming that Profiler is running and not minimized to the system tray. Prod. Year shows the earliest production year for any of the children if this doesn't match the entered production year for the parent. Runtime shows the sum of the runtimes for the children. If the runtime for the parent has been measured exactly, it can differ from the total of the children because of rounding errors, since the runtime for each child has been rounded to the nearest minute. 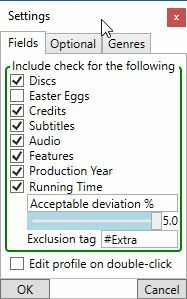 Also, if there are children whose runtime should not be included, such as discs with bonus materials, the shown sum will include these and produce an incorrect total runtime. So please use the shown runtime as an indicator only, not as an absolute truth. My freeware tools for DVD Profiler users. Aim high. Ride the wind. Oh, I like this! I have always been perplexed by the myriad of rules for making a valid contribution, so I think it is so useful to have a tool which makes it easier to follow the rules. - You can save a flag set of the resullt from the different tabs (see help file). - Settings window added where you can unselect items you don't want reported. - You can also configure that double-clicking a row should open the profile for editing in Profiler (rather than just selecting it). - There is an "Always of top" function in the menu. Added a few bells and whistles in version 1.2.0. Optional checks lets you include checks for fields that are not explicitly forbidden by the rules, but that you may feel do not belong in a box set parent. 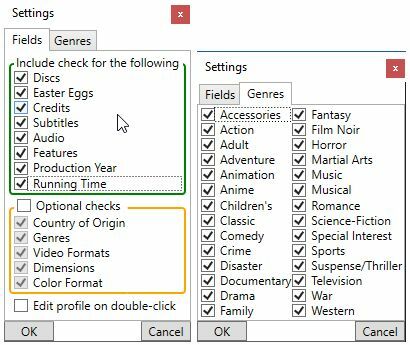 In the Genres tab you can unselect genres that you do not wish to include. This is perhaps most useful for Television, which is a bit special, but you can exclude any genre you wish. I have also added a popup window that hovers over Profiler after you have double-clicked a row in the Non-compliance tab. This small window shows which non-compliant items the program found. You can read more about it in the updated help file. Well, I have realized that the bells are a bit, well, lacking. KISS - Keep It Simple, Stupid! That's an old advice that I have sometimes passed on to younger developers. I wish I had taken my own advice. My initial though for Genres was to just have Televison - include or exclude. That would have been simple. But no ... I had to go all hog and make it complicated. The way it works in 1.2 is if a genre is checked, the profile is included. Sounded fine in my head. What I forgot to take into account is that if you uncheck Television, that will only exclude television profiles if they have no other genres checked. So, now the Genre checkboxes are three-state. 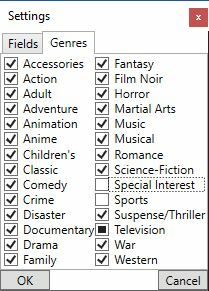 Note, though, that they don't work exactly like the Genre filter in Profiler. The "boxmark" for Television means it will be excluded, no matter what other genres the profile may have. See also the updated help file. I hope I don't have to re-polish the bells and whistles again. Egad! I'm slipping in my testing! Found a bug in Settings. Checking Optional checks did not enable the checkboxes with less than you saved the settings and reopened it. Going through all my box sets I found that I wanted to make two more adjustments to BoxSetInfo. 1. I rearramged to order of the non-compliance notes so they are now in the same order as the tabs in DVD Profiler. So Production Year and Running Time come first, then Features, then Audio and Subtitles, etc. 2. I found it a bit awkward to delete cast and crew, so now when the popup window has focus you can press Ctrl-A to get an empty cast list on the clipboard, and Ctrl-C to get an empty crew list. Then you can just paste them into Cast and Crew respectively in Profiler. Since I have go through all my box sets now, it is unlikely that I'll find anything more to change by myself. However if anyone else has a request I will certainly consider it. The final (?) version is 1.4.0. It seems that the fat lady hasn't sung yet, as far as BoxSetInfo is concerned. I received a suggestion for how to handle running times, that made a lot of sense. So expect a "finaller" version in the near future. You can now set a percentage (0.0 to 5.0 in 1/10 % steps) acceptable difference between the running time stated in the parent and the combined running time of the children. If you run it at 5.0 % you should find the worst "offenders". Some of these may have discs that should not be counted. If so, you can create a tag for those child profiles and specify that tag here, and they will not be counted. Obviously 5.0% is a very large deviation. Once you have weeded out the worst cases you will probably want to rerun the check with a lower setting. Rounding errors should not account for more than 0.5%. Will version 1.5.0 be the one that the fat lady sings to? Only time will tell. Tip: Saveing a flag set for the 5% run and loading it in Profiler will make it easier to spot those children that need to be excluded. Just remember to re-export your collection after you have flagged them. PS. Have you created a command file to facilitate exporting your collection? If not, you really should. There is a detailed explanation in the help file for ProfilerQuery (under Bells and Whistles) if you don't know how to do it. Or see here. Fixed a couple of bugs in Genre selection. Now version 1.5.1. Anyway: many thanks for all the work you continue to put in. Much appreciated! Thanks! Always nice to hear that someone appreciates the effort.